It is usually impractical to completely sound proof a room within a domestic property but if the following advice is taken, reasonable levels of sound insulation can be achieved which will reduce any noise nuisance affecting your neighbours. Party walls and any other walls as may be required should be insulated before anywhere else and can be upgraded with our Acousticel M20AD recycled rubber product. However, it must be noted that modern properties with cavity walls and built with more lightweight materials may allow flanking noise around party walls. Mineral wool insulation in the cavity helps reduce this problem but the only effective solution is to insulate any juxtaposed cavity walls with our M20AD. Normal domestic doors are too light and ill fitting to provide effective sound insulation. If more sound insulation is required, they can be replaced with plaster filled fire doors, fitted so as to be airtight when closed which will entail the fitting of a threshold. Good seals can be achieved using good quality draughtproofing. Mortice locks and open holes through the door should be avoided. A double door entry system will be more effective at reducing noise breaking through. This entails two plaster filled fire doors fitted so one opens outwards and the other opens inwards. Both should be fitted with our acoustic doorseal kits. Now the room has been insulated, you will want to reduce the reverberation. Reverberation amplifies the sound originally emitted so the sound has to be absorbed. To achieve this we recommend Echosorption Plus is used to line the upper walls and ceiling. 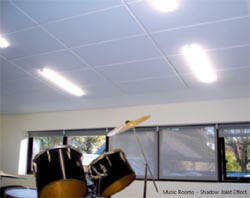 This will reduce the reverberation and also the amount of noise breaking out of the room.